GTD: Matt, how many summers did you train in Coach Braz’s program? What got you started doing it? How has it changed, from your perspective, from the beginning to now? Matt: This summer was my 4th year training in Coach Braz’s GTD program. I picked it up the summer after my freshman year in high school, and have stuck with it ever since. I was drawn to Braz camp initially because most of the Bishop Fenwick XC team trained at the camp, so I saw it as an opportunity to become a more competitive runner while still training with my teammates in the offseason. It’s fascinating to see how the camp has grown and expanded over the past few years. Braz camp has a unique ability to connect runners from so many different schools by the simple fact that most people return summer after summer. When I went to big invitationals or state meets, it was great to be able to recognize and reconnect with allv the guys and girls I trained with over the summer. 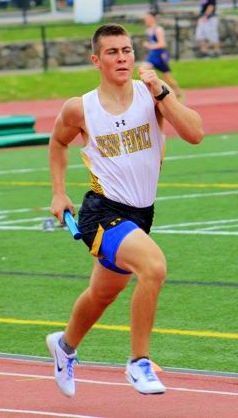 GTD: Tell us about your running life at Bishop Fenwick high school? Matt: I had an awesome experience running for Bishop Fenwick, and most of that can be attributed to my great teammates and coaches throughout my high school career. It was neat to be able to see the transition in the XC and track programs from my freshman year – which had a strong core of seniors – to my senior year, which also had a really talented group of leaders. I was captain of the cross-country team for two years, as well as captain of both indoor and outdoor track. We won the Catholic Central League Championship a couple times during those years, and I personally hit some big goals and competed at the state level in the 1000 and the 4x800. But beyond that, some of the best memories of my high school running career came from the day-in, day-out grind with my teammates. I just love the process of training, which I think is the most important part of the whole package. GTD: You graduated from high school this past spring but before heading to the University of Connecticut, where you would NOT be running xc in the fall, you came to the Braz xc camp. Why? Matt: It’s a combination of things. First of all, it’s a great way to reconnect with the people who I might not see as much otherwise. Braz camp is definitely a social, interactive place to be in the summer (but there is a time and a place for the social part, just ask Coach Pete). Then of course there is the fitness aspect of Braz camp, which can’t be overstated. I always come out of camp in August in the best shape of my life, and it feels fantastic. Like I said before, it’s the process that I’m drawn to. Braz camp is all about the process – nutrition, hydration, variations of running workouts, stretching, plyometrics, core, and even mental strength. GTD: During the 90 to 120 minutes of each session in the program – 18 sessions in July and August that start at 8am – were there moments you loved, and some not so much? Tell us why. Matt: One of the coolest moments I remember from my years at Braz camp was a Friday session in the pouring rain, where we ran the cooldown in a thunderstorm. Running in the rain usually isn’t fun; but you reach a point where you are running in monsoon-like conditions and just don’t care anymore. The adrenaline is pumping, everyone’s having a great time, and it’s one of those things you just don’t forget. I suppose that there were a few moments I didn’t love so much, as well. I can remember one day that I had just finished a really tough workout, and was in the mindset to do a little stretching before calling it quits for the day. But Coach Braz had us stay an extra half hour for plyometrics and strength work (tons of squats). In the moment I sure didn’t love it, but I guess looking back on it I appreciate Coach Braz pushing us a little harder than usual. GTD: Sometimes when it’s over, runners think about those moments in a race where they lost focus (and time). Did you have any of those “lost moments” in Braz camp? Perhaps when you may have just gone through the motions during a core session, other times? Matt: I could definitely point to one of the workouts this past year that really left me feeling beat, in more ways than just physically. It was a 55 minute tempo run, with the pace getting increasingly faster every couple miles. The weather that day was brutal – mid 90’s, high humidity. I was able to finish the run, but far off the pace that Coach Braz designed the workout to be. It was one of those days that my mind wasn’t in the right place, and the tough workout in that weather just added to the feeling of overall sluggishness. It was a rough day; and there are always going to be rough days at camp. It’s just a matter of coming back for the next workout ready to bounce back and work hard. GTD: How did you handle nutrition during your racing seasons. What about race day? With xc camp starting at 8am in the heat of summer, what did you do for food/drink BEFORE 8am? Matt: I am a very routine-oriented person. During my racing seasons, I try to keep my pre-race meals relatively constant (there is some superstition involved). The night before, I always load up on pasta and drink more water than I think I need. The morning of the race, it’s usually a bagel with peanut butter, a banana, and yogurt. Also, I make myself drink water even when I am not thirsty. Other than that, I try to keep something in my stomach throughout the day up until about an hour before my race (sandwiches, more bagels, peanuts, protein bars). I actually treat Braz camp similar to race days in some respects. Breakfast is usually some sort of bread or bagel with a ton of peanut butter on it, and I drink a couple big glasses of water. Timing is pretty important, too; I want to be done with eating by 7:30 at the latest so I don’t feel the food in my stomach while running. GTD: What are you studying at UConn? Long-range plans? Any opportunities to run or do other sports? Matt: I am studying nursing at UConn, and I plan to go into the field of emergency medicine working as a flight nurse on a helicopter. I might explore some sort of career in the Coast Guard, as well. 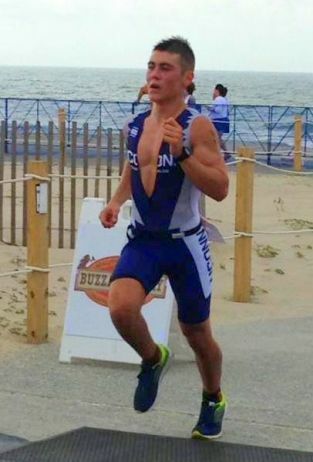 Although I am not ‘running’ at UConn, I am on the triathlon team (which has a fall season similar to cross-country). This fall I raced in Olympic-distance triathlons at Lake George and Westchester, and a sprint-distance triathlon in Buzzards Bay. I love the sport and plan to run an Iron Man Triathlon before I finish my collegiate career.